How Micro Is Your Tasking? “What are you doing now?”—when you hear this question from your boss, be aware: you’re dealing with a micromanager. Keeping us busy is the key objective of these creatures and this is what makes them so annoying. To the contrary, effective managers make sure we are productive, meaning that our results satisfy their expectations. They are not interested in knowing what we are doing to deliver them—they manage the project, instead of managing us. And the first step to making the project manageable is to decompose its scope into smaller pieces. Imagine you want to re-design your apartment, having a few thousand dollars for this job. You hire a group of people and give them all your money up front. They ask you to come back in two months, when everything will be ready. You say “OK” and wait for two months. I’m sure you already know what I’m getting at—this project most probably will be a failure, to some extent. In the worst case you won’t see these guys ever, they will just steal your money. In the best case, they will do something that will look “nice,” but not as nice as you expected. What do you do in order to increase your chances of getting the best case scenario? That’s right, you micromanage them: you visit them every day, you ask them the famous “What are you doing now?” question, you push them when they are getting lazy, you control, you dominate, you annoy, you “stay on top,” you play the guilt card when they miss or forget, you punish them every way you can. The more aggressive you are, the higher the chances you win. You don’t do that because you’re evil. You just know that otherwise they will trash your apartment, will forget things, will miss something, will make mistakes, will spend more time and money than they are supposed to, will choose wrong fabrics, will purchase the furniture you don’t like, and will do many other things you’re well aware of if you’ve ever dealt with interior designers and house builders. And it’s not because you are evil. You’re not evil, you’re stupid (not you personally, my dear and respected reader, but you get the point). Micro-management vs. micro-tasking (webinar #25); 7 June 2017. One of the key success factors for manageability is the famous 0/100 rule, which requires any task to be either “in progress” or “complete.” There can be nothing in the middle. When such a rule is in place, the task can be delegated to its performer and they can become responsible for its completion, they can be trusted. We can’t “trust” our single large task to the performer, simply because it’s too big to be trusted. If they fail, the cost of failure will be too high. We have to take a micro-scope and get into the task to manage it from the inside, annoying its performers, whom we are supposed to trust. The micromanagement we do is inevitable, because the scope is not broken down. M19: Want to pay-by-result? You have to do microtasking first, otherwise nothing will work. ; 22 January 2019. Scope decomposition was invented mostly in order to solve this very problem: to make the project more manageable. We need small tasks in the scope in order to be able to delegate them and never go inside in order to check what’s going on there, who is doing what, why, and where. The smaller the tasks we can break the scope into, the better. How small can tasks be? In our projects we break project scope into tasks of 30 minutes each. This may sound too extreme for you, but it works for us. We call them micro-tasks. We started to practice micro-tasking about seven years ago. We experimented with different task sizes, from 10 hours to 15 minutes, but eventually came down to 30 minutes. When tasks are bigger, we lose the manageability and simply get back to macro-tasking. When tasks are smaller, the context switching overhead becomes too annoying. 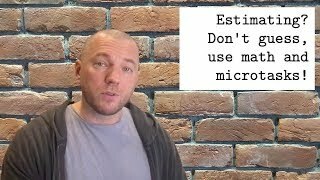 M27: Microtasking enables more accurate and precise estimates of a software project's future; 1 February 2019. In our experience, a senior programmer, if fully dedicated to a project, completes 6-10 tasks a day. This means that they spend 3-5 hours working, while the rest of the time is spent on doing something else. This is a much more effective use of work time than we can achieve with traditional macro-tasking management, where programmers barely work for two hours a day, spending the rest of their time on something else (my personal observation). What obstacles did we have? Vagueness. Definition of done, exit criteria, requirements, expectations—there are many names, which are all about our inability to define what exactly we expect programmers to do. Software development by definition includes a lot of unknowns, creativity, experiments, and risks. Programmers will tell you that they can’t guarantee anything in most cases, and can’t really give any valid promises. We solve that by PDD. Distraction. Programmers are used to doing many different things at the same time: they write code, help others, watch YouTube, scroll Facebook, swear at Reddit, and read my blog. Initially most of them won’t like the idea of having explicit tasks in front of them, simply because they put a structure on their work time, making it much more visible to the management. They will tell you that they have many other things to do aside from your bloody tasks. We solve that by paying by result and prohibition of chitchats. They are simply spoiled by the traditional macro-tasking where they are paid by the month and nobody really controls their results. Laziness. Just like that apartment designers, programmers also love to get paid and do nothing. Who doesn’t, right? They will tell you that their work is more complicated than you think, that they need much more time, that they need to investigate the problem first, that reading documentation also takes a lot of time, etc. They are simply spoiled by the traditional macro-tasking where they are paid by the month and nobody really controls their results. They are used to being office slaves lazy. We solve that by paying by result and the lazy ones simply quit. Responsibility. Micro-tasking will make individual results visible. When tasks are large people tend to work with them in groups and it’s unclear exactly who is responsible for failures and successes. Smaller tasks emphasize mistakes and make people “pay” for them. Not necessarily with cash, but definitely some way or other. Most programmers will find this concept very new and disturbing—they’ve almost never paid for their own mistakes before and never had their own tasks. The responsibility was always spread across the group. We solve that by monetary rewards and punishments, which make them very motivated and failure-ready. Resentment. 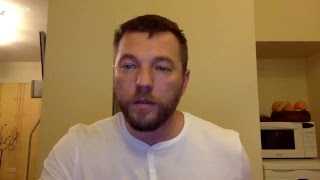 This is one of the most popular and the most annoying of problems: they will tell you that they are “not monkeys.” They will actually combine all problems listed above and say that the right way to solve them is to give programmers freedom and let them do their job, since they are smart enough and don’t need any management from the top. And they will mostly be saying it quite honestly, with no intent to manipulate. The thing is that they are used to macro-tasking and believe that this is the only and the right way. I’m trying to solve this by writing this very blog post. There could be something else, but this is a more or less an exhaustive list of the problems we were faced with. Obviously, any approach has its pros and cons. Micro-tasking seems to be the most effective management paradigm for us. However, it’s not applicable everywhere, according to our experience. There are territories where we failed to apply it. Prototyping. Every project or a new big feature starts with a prototype, which requires one or two people sitting next to each other, thinking, and experimenting. We tried to break this piece of work into smaller parts, but failed. It seems that this process has to be done as a single solid work package. UI/UX. We were mostly working with server-side Java/Ruby/C++ projects for the last few years and didn’t have many opportunities to apply micro-tasking to the UI/UX jobs. However, whatever we did try never really worked: graphic designers weren’t able to decompose their tasks into smaller parts. Customers. We tried to decompose the task of eliciting requirements from our clients and failed a few times. Maybe our clients were stupid (I doubt that), maybe requirements were too complex, or maybe our system analysts were not professional enough. The bottom line is that we realized that such a task must be done as a solid piece of work, without any decomposition. Fire-fighting. When the speed of delivery is the most important concern, micro-tasking doesn’t work for us. The overhead for dispatching and specifying tasks was taking too much time. When something is really urgent, we have to do the traditional macro-tasking and just “make it work.” Then we get back to micro-tasking. Everything else, including programming, unit testing, manual testing, performance/load testing, integration testing, deployment, code review, documentation, and even training, can and must be managed via micro tasks. What benefits do we get? Money works. When tasks are very small, we can use good old dollar bills to motivate programmers. We can throw away literally all other instruments. We pay less. We seriously lower our expenses, even though hourly rates of our programmers are higher than many other projects can afford. I did a more or less detailed analysis a few years ago, which demonstrated that our projects were 30 (!) times more cost efficient than traditional ones. Motivation is high. Despite a very common stereotype that small and isolated tasks demotivate their performers, we see quite the opposite reaction: programmers are excited when it finally becomes possible to work within well-defined and explicit boundaries, independently, and in isolation. Not all of them, though. My personal observation is: only 25% of them can understand and enjoy micro-tasking. Others are either not professional enough or spoiled by office slavery, where it’s possible to do almost nothing and stay very respected and well rewarded. Turnover is not painful. To make micro-tasking possible the management has to learn how to specify them: explicitly, unambiguously, and fast. When such a high level of transparency, formality, and agility (at the same time) is achieved, the project becomes less dependent on experts. We lose the fear of losing people, because almost everything we need to know about the project is inside our task tracking system and project documentation. Easier to parallel. Smaller tasks are easier to delegate to a larger amount of programmers. In some projects we sometimes have over 40 programmers at the same time, while the amount of tasks is relatively small (up to 200). Metrics work. When one programmer closes 40-50 tasks per week and another one closes 5-10, it does mean something, keeping in mind that all tasks are almost equal in size. We use this metric (and a few others) to make organizational and discipline decisions. In a macro-tasking environment almost no HR metrics really work. Quality is enforceable. Large amounts of small tasks implies that we constantly and frequently close them. Each closure is an important point for quality control. That’s exactly where we have the ability to say “No” and reject the deliverables that violate our quality standards. With big tasks this “No” is much more painful for programmers. Risks are acceptable. It’s impossible to accept the risk of the entire apartment redesign failure, since its cost is too high—a few thousand dollars. However, it is absolutely affordable to accept a risk of a kitchen lamp installation. Even if it falls and breaks, we will spend a few dollars and buy a new one. We don’t need to control the “lamp person”—we have a luxury to delegate and trust. The benefits programmers get overlap with our benefits. 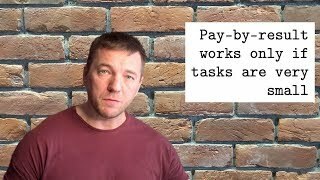 If they are professional and motivated enough they find it effective and productive to work with micro tasks, which are always well defined and properly paid. Are we monkeys or not? Now the most typical complaint we hear about micro-tasking is: “It is for junior programmers who are OK with being code monkeys.” To be honest, I also thought so a few years ago, when we started to experiment with XDSD. What I quickly found out is that the most professional and self-motivated developers were enjoying micro-tasking, while their less mature and less skilled colleagues were finding it difficult to keep up.